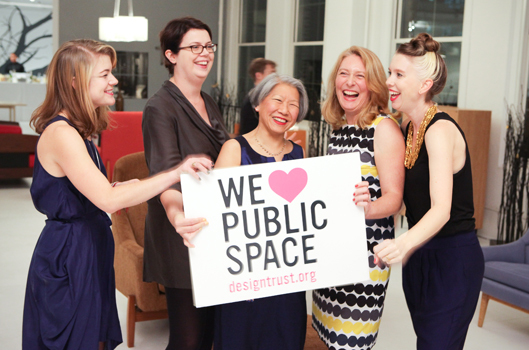 The Design Trust for Public Space is a 501(c)(3) not-for-profit organization dedicated to improving public space in New York City. Read more about what we do for all New Yorkers. Members of the design, financial, and philanthropic communities sit on our board of directors. We have two new staff openings for a Development Director and a Communications & Events Associate. Caroline Bauer joined the Design Trust staff in June 2012, after completing her M. Sc in Urban Planning degree at Columbia University's School of Architecture, Planning, and Preservation. Prior to joining the Design Trust, Caroline worked in the Architecture & Construction Unit at the United Nations headquarters in New York. She holds bachelors degree in Anthropology from Mount Holyoke College. Megan Canning joined the Design Trust staff in June 2005, after spending several years working in arts administration in New York City. In her nearly eight years on staff, Megan has played an integral role in every aspect of the organization. In 2008, she was promoted to Deputy Director from Director of Operations, and for six months in 2011, she guided the organization through a transitional period as the Acting Executive Director. In 2010, Megan was named one of the top 30 young civic leaders working in the U.S. to improve our cities by Next American City. Megan holds an MFA in Painting from Hunter College and a BFA in Art Education from Ohio University. She is an artist and urbanist with a passion for the intersection of design, culture, and cities. Susan Chin joined the Design Trust in October 2011 after 23 years serving New York as Assistant Commissioner of Capital Projects at the NYC Department of Cultural Affairs. In this position, she developed and guided a capital program of $1 billion, with $1 billion more leveraged in private investment, for over 200 cultural institutions throughout the five boroughs. At the Design Trust, she has overseen the completion of Five Borough Farm and Making Midtown, and the organization's first strategic plan. She is an American Institute of Architects Public Architects award recipient, and the 2011 chair of the AIA Gold Medal Award advisory committee. She is the 2013/14 Vice President of The American Institute of Architects (AIA) and a former President of the AIA, New York Chapter. Rosamond Fletcher joined the Design Trust staff in November 2012 after spending six years at the Center for Architecture/AIA New York Chapter producing exhibitions and programs, including: Glimpses of New York and Amsterdam in 2040, Jugaad Urbanism: Resourceful Strategies for Indian Cities and Our Cities Ourselves: The Future of Transportation in Urban Life. Rosamond brings extensive experience managing multidisciplinary project teams, as well as securing grant funding and building strategic partnerships. She holds a Master of Environmental Design from the Yale School of Architecture and a BArch from the Rhode Island School of Design (RISD). She is also an avid urban gardener.